Tonight I'm celebrating opening the first bottle of Saison Morency 2008. I live on the third (top) floor of a condominium building, so it gets quite warm in the kitchen, which is where I ferment my beer. A few years ago I started using a lot of yeast strains from Belgium. I've found the saison-style strains like Wyeast 3524 and 3526 as well as the White Labs WLP565 work very well fermenting in the upper 70s and 80s. I've used these strains to make all sorts of beers as well as what would be considered more traditional Saisons. Each year I brew a "signature" Saison-style beer. This year's batch has turned out quite well. 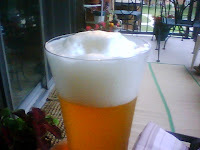 The first glass poured hazy gold with a rocky, white head of foam. It smelled earthy, peppery and spicy. The palate was very soft. Sweet malt flavors very briefly washed over my tastebuds, then the spicy, peppery esters and hops flourished, paving the way for an assertively bitter, dry and long finish. Lacework was left behind down the sides of the glass as I savored each sip. I couldn't ask for much more from this beer and I'm very happy with it. I just wish I brewed more than just one case of 22-ounce bottles! To older people who bemoan the crass-ization of our culture, the rise of prurience and the grotesque in mainstream media, I present you with a bottle of Coney Island Lager. Tell me that face does not launch a million nightmares. Yet, it is merely a reproduction of the rictus grin-head that greeted many amusement park goers in the first half of this century. These decadent zones housed freak shows, thrill rides, and bad food galore, and were probably places where nice girls met bad boys. They were also great social levelers, bringing immigrants and the rich and poor together. 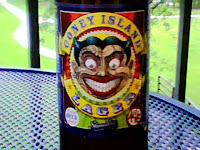 Well I say, in my best Butthead voice, “Old freaky stuff is cool.” So is Coney Island Lager. The label caught my eye but when I read about the beer, I clutched it to my chest in anticipation. Eight malts, six hops, and Czech Pilsner yeast. The label promises “the thrill of the old world with a new world flavor,” and it delivers. The multiple malts and hops work together in to create a beefy mouth that you now expect from an American microbrew. But the yeast is like an old man sitting between a gay couple in a park – a reminder that no matter how much things change, the past is never that far away. This is clear if you take one more look at the label. Proceeds from the sale of the beer go to Coney Island USA, which is devoted to keeping lost forms of popular arts and culture alive and preserving New York’s historic Coney Island neighborhood. Shmaltz has created a whole line of beers to support this cause, including Albino Python spicy white lager. Old people, don’t tell me how degraded we youth are. Everyone has always needed their freaky stuff – we have the proof! Well, it's the beginning of July, which is American Beer Month. Every year I try and drink only American beer for the whole month. It never works. I always end up drinking an import and my fellow beer connoisseur Ryan was tempted by an Elizabethan treat this evening. Perhaps as the brothers of Beer Advocate have suggested, we can all enjoy a beer from a small brewery, in the proper glassware and the right environment. It seems Ryan has done just this tonight in his cellar. 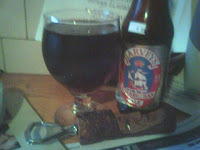 A beautifully aged Harvey's Elizabethan Ale was the treat of the evening; a beer so darn good that my friend was moved to "think of chucking the Declaration of Independence in the Delaware, and put a copy of the Magna Carta in my pocket instead." It was that good. Granted, Old Ale is his favorite style, but I've had one of these beers myself. In fact, I picked up said beer at the Blue Max in Burnsville, Minnesota about at least a year ago and the particular bottle consumed was filled in 1996. Yep, that's right 1996. I don't know if you'll find another bottle from 1996, but Ryan recommends that you, "Find this beer, and treat it with dignity and respect." Ryan's full review of the beer is at Beer Advocate.